The Quantum acrylic frame offers a very contemporary look and feel by introducing a bevelled edge through a 10 mm piece of crystal clear acrylic, which forms the face of your product. Your image is then sandwiched between another 3 mm back plate and held with four brushed aluminium studs. 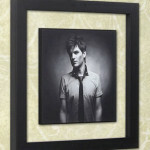 You will need to supply one (1) image with each Quantum Acrylic frame. Be the first to review “Quantum Acrylic Frames” Click here to cancel reply.